1800' SPACIOUS BEACH HOUSE-Lake and Golf Course Views-Just minutes to the beach! 2 GOLF CARTS, BIKES, RESORT TRAM, FREE WIFI, POOL, HOT TUB, FITNESS CLUB, BEACH/ POOL ACCESORIES, FISHING AND INCREDIBLE VIEWS ARE ALL INCLUDED! ALL NEW CARPETS, FLOORING, PAINT & APPLIANCES!! This spacious lakeside beach house in Laurel Grove speaks for itself. Situated on the 17th hole of the Raven Golf Course, the view is truly spectacular. The golf course is a beautiful backdrop to this lakeside house; always active with birds to watch, fish to catch and turtles to feed. All of this is viewed from the comfort of the full wrap around covered deck with gas barbecue for outside grilling. The beautiful morning sunrise is shaded by the fragrant jasmine vines and the wonderful oak trees. The expansive front lawn is a favorite location for a variety of lawn games. The Laurel Grove neighborhood is located in the 2400 acre, World Class, Sandestin Beach and Golf Resort on the Emerald Coast of Florida, renouned for its white sand beaches on the Gulf of Mexico. As an Owner, I offer a 24/7 personal touch that only an Owner can offer! Our house interior is 1800 square feet with a golf course and lake view from almost every room. It is beautifully decorated with Brazilian Cherry hardwood floors, top of the line stainless steel appliances and granite throughout. Each of the 3 private bedrooms have their own full bathroom and TV with DVD for relaxation. The Master bedroom with king bed has access to the deck, the Guest bedroom with 2 full beds is quietly tucked in the back corner and the upstairs Suite with queen bed and lounging couch, has sweeping views across the lake and golf course. The kitchen is fully equiped with all the dishes and cooking utensils necessary for cooking any meal, the laundry is right off the kitchen and the outside beach storage unit is open for guests. The Laurel Grove clubhouse, private to owners and guests, provides a large wonderful pool, adjoining hot tub and gas barbecues with a full kitchen for poolside dinners. The clubhouse also features a brand new fitness center with flat screened TV's for viewing. The Clubhouse is situated lakeside with abundant landscaping. The Village of Baytowne Wharf is the 'heart and soul' of Sandestin and the gathering place for everyone. Discover this active pedestrian bayside village and explore the over 40 shops, award winning restaurants and wonderful nightlife. The Marina is a special place for a walk and the daily ferries a treat for a ride on the bay. The large added childrens playground is a favorite place for families eating ice cream cones while children play. Special events such as The Emerald Coast Blue Marlin Classic, the Artsquest Fine Arts Festival, The Sandestin Wine Festival are held annually along with many weekly and daily events and family activities.Beachside offers pitch and putt, beautiful beaches and The Market Shops to wander around. The Grand Boulevard and the Silversands Outlet Mall all surround Sandestine for the added highlights of shopping and dining. Trails weave throughout the resort from bayside to beachside with your own private golf carts, as well as bikes or resort tram to wander the 2400 acres of this beautiful vacation experience. Whatever you dream your vacation to be...........it can all be found here at your Laurel Grove cottage on the Gulf of Mexico! Our family chose to purchase our cottage at Laurel Grove because, after being transferred and selling our family home at Sandestin, we knew we wanted to remain a part of the resort atmosphere with our holidays including the beach and golf lifestyle. In the past we have been lucky enough to spend time here at least once a month. Now that our children are growing and moving away, we recently decided to share our cottage with other families through the VRBO rentals. We knew anyone lucky enough to spend time here would have a vacation to remember. We chose Laurel Grove because it allowed our family the quiet solitude of a friendly community after a busy day at the resort. Laurel Grove is centrally located with access to all areas of the resort. We liked the opportunity to use our club facilities to socialize or opt out and enjoy the privacy of the cottage. We were lucky enough to chose a prime location in Laurel Grove with wonderful views either for solitude or entertaining. We also liked this particular cottage because the expansive front lawn, away from the roadside, was perfect for the kids and we loved all the cottage windows allowing views from almost every room. I think our favorite thing to do is to sit on the deck at the end of the day with a glass of wine and watch the golfers go by as the sun sets........or........ is it to sit on the deck at the beginning of the day with our coffee watching the sun rise? Our cottage has a grill on the full wrap around deck facing the golf course and lake view. It is in the quiet section of Laurel Grove very near the pool, hot tub and fitness club and beach just a short golf cart ride away! 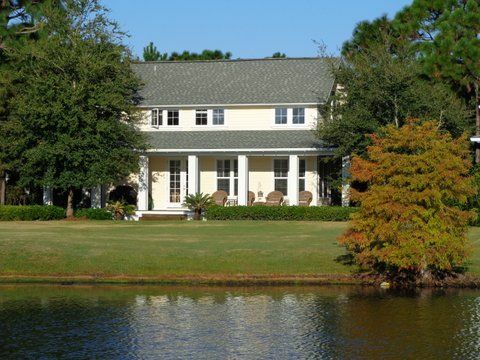 The fishing in the lake is wonderful and the expansive front lawn is one of the largest in Laurel Grove. The 2 golf carts are included and a definite must. The inside is simple luxury with views from every window and tv's in every room. I offer a 24/7 personal touch. A uniqueness that only an Owner can offer. Once you come visit............you will never want to leave! See for yourself. Kitchen fully stocked with everything needed to cook and eat your meals. Extra items include a crockpot. We have left our family bikes for your use but please treat them as good as you would treat your own! Large full wrap around deck perfect for entertaining. Beach Chairs, Beach Umbrella, Wheeled Cooler, Boogie Boards, Floaties , Pool Toys, Sand Toys , Fishing Rods etc. We had a wonderful week staying in Laural Grove in Sandestin. It's a great family friendly community! We loved it and would absolutely stay here again. I am happy that your family get-together was so enjoyable at Laurel Grove and that all our new house updates were appreciated. We look forward to you all coming back and having more time to explore Sandestin together. Awesome place to stay with family!! It is good to hear you all had a nice vacation. We will look forward to seeing you again soon and, with all the new house updates occuring next month, your return visit will be even better. Come and check it out! Perfect place for families to come - 2 masters and a spacious living area. Golf carts were super nice to have on site to get around the large and beautiful resort. Nice for pets to have access to play in the back yard while we enjoyed views on large back porch. Would definitely recommend and would come again ourselves. Kathy...... sounds like you all had a nice vacation at Sandestin and enjoyed one of the nicest locations in Laurel Grove. We have all new changes coming up in the new year so your next visit will be even better! We will look forward to your next visit. The absolute perfect vacation! The house was amazing! It was perfect for our family. We had plenty of room and loved the wrap around porch for relaxing in the evening. A beautiful place with all the comforts of home. The golf carts were perfect. The short drive to the beach, the wharf and shopping was great! I can't say enough about the community. It is quiet and beautiful. The golf courses are awesome! Debbie is the best! She was very accommodating, responsive to my questions and very helpful in every way. We would love to stay here again. Thanks for everything Debbie!!!! We had a great time! Thank you Joe and Jenny for your kind words about our home in Laurel Grove. I am so happy to hear that everything worked out perfectly for you and your family. I look forward to the next time you come back to relax and enjoy! Our 1800' cottage is in a very tranquil neighborhood with one of the largest heated community pools, hot tub and fitness club. Just a short golf cart ride to the resort beach, bars, restaurants, cinemas and wonderful shopping including the Outlet Mall next door. Baytowne Village has many bay front activities and musical venues, restaurants and bars. The Grand Boulevard is right next door with more restaurants, bars and also shopping. Down the highway there is Big Kahuna Waterpark, The Florida Gulf Aquarium and many various aged activities at the Race Trax Park including Go-Carts and Mini-Golf.